What he needs to know. President Donald Trump went on another Twitter rant Tuesday morning to claim that Google (a subsidiary of Alphabet (GOOG - Get Report) , (GOOGL - Get Report) ) is rigging search results to favor left-leaning publications and "suppressing voices of conservatives." But as TheStreet's search engine optimization strategist, it's my job to have an in-depth understanding of how Google works - and based on my expertise, I believe the president is wrong. It appears to me that Trump was getting his information from a piece that conservative PJ Media published Saturday, headlined: "96% of Google Search Results for 'Trump' News Are from Liberal Media Outlets." Google keeps the computer algorithm it uses to generate search results confidential, but SEO experts like Brian Dean of Backlinko have estimated that there are over 200 ranking factors that go into what you get when you type a query into Google.com. Despite popular beliefs, none of those factors involves companies paying Google for better search resuits. Instead, the factors that apparently carry the most weight are how many times other Web sites -- professional media, amateur blogs and anything else under the sun -- link to a given piece of content, plus the quality of the content itself. Brian Hart of Flackable, a PR and digital marketing agency, told TheStreet that Google "is in the business of relevancy. Results are largely driven by authority and keyword optimization, not political affiliation. If political bias could boost search results in any way, SEO folks like myself would have figured it out by now and found a way to profit off of that knowledge." Listen below as Eggers explains to Tracy Byrnes why it's all one big algorithm. To rank highly on Google in a particular search query, you need to optimize your content for what we experts call the "search intent" of a term that someone types in to Google.com. 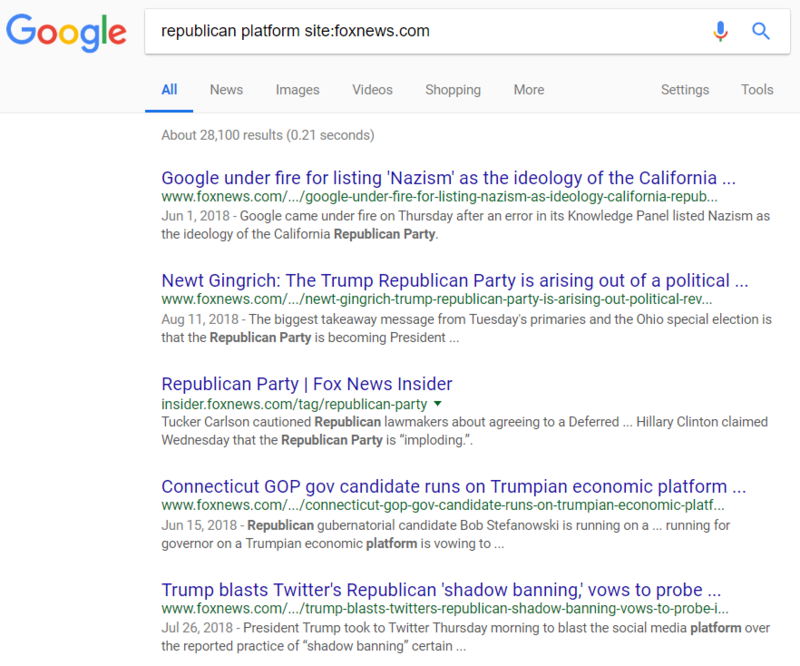 For example, if you want to rank well for the term "Republican platform" (one of the keywords that PJ Media claims is biased towards the left), you want to understand what people who enter that into Google.com are looking for. The first two results I got when entering "Republican Platform" into Google were from the Republican National Committee's official GOP.com site, which I find odd if Trump claims that Google is biased against conservatives. Beyond those first two items, I got a Snopes.com article that fact-checked a myth about the 1956 Republican platform. Then I got a Huffington Post item showing a transcript of the GOP's 2016 platform, plus a few more results from publications that PJ Media identifies as left-leaning in a "media-bias chart." The same thing happened when I combined "Republican platform" and right-leaning publication The Federalist.com. Sorry, Mr. President, but Google can't make an article that's never been written magically appear out of thin air. Another factor that experts believe Google uses in ranking search results is "authority," defined as how many times other sites link to yours. CNN does especially well with this on Google (especially Google's "News" tab) even though the network is one of Trump's least-favorite media outlets. Why is that the case? Well, a recent check that I did found that 884,054 Web sites were linking at that moment to CNN.com. That naturally included links from other high-profile publications, like The New York Times, which had more than 23,000 links to CNN. This automatically tells Google that CNN is more "authoritative" than a publication like the conservative-leaning Washington Times, which only had 114,058 sites linking to its content when I did my recent check. Yes, The New York Times has also linked to The Washington Times, but only 392 times. On top of that, it's natural to see CNN appear more frequently in Google's search results simply because the media giant produces so much content. You can see Google's official response to Trump's allegations here. My view is that Google naturally wants to keep and expand its user base to keep the company's ad platform alive. You have to keep that stock price chugging higher, after all. But if readers lose faith in Google's search engine, the company won't have any users to deliver ads to. So, it's in Google's best interest to provide accurate and trustworthy results. "Google draws news articles from a variety of sources, from The Washington Post to Fox News," said Michael Heiligenstein, the head of SEO at FitSmallBusiness.com, a small-business educational publication. "They don't have a [reason] to display false information, and would be providing a worse service to customers if they did so." Hey, maybe right-wing publications should take a page from TheStreet's playbook and hire their own SEO specialists!